About this object The postcard depicts the Capitol prior to its 1950s renovation. 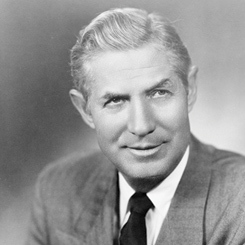 The wartime 1944 elections bolstered Democratic majorities in Congress. Franklin Roosevelt won a fourth term as President but died just months after his inauguration; Vice President Harry S. Truman succeeded him. 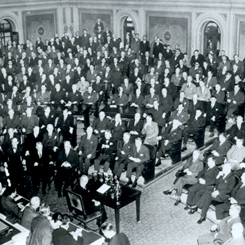 As World War II ended, the 79th Congress (1945–1947) reinforced the country’s international role with membership in the United Nations, the International Monetary Fund, and the World Bank. It also instituted the Fulbright scholars program. Congress increased the federal government’s involvement in the economy with full employment legislation, new airports and hospitals, and atomic energy development. 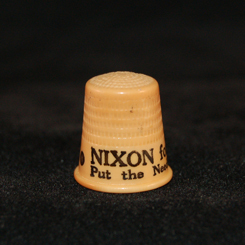 Congress also streamlined bureaucratic procedures as government modernized. President Franklin Delano Roosevelt made his last appearance before a Joint Session of Congress to report on the Yalta Conference. President Harry S. Truman signed the Legislative Reorganization Act of 1946 into law on this day. Riding widespread discontent with the postwar economic policies of the Harry Truman administration, Republicans recaptured majority control of the House from Democrats for the first time in 15 years. 1Resigned from office December 31, 1945.